Made entirely with natural, nutrient-rich ingredients, Eleanor Ozich’s decadent, creamy mousse satisfies those sweet cravings. 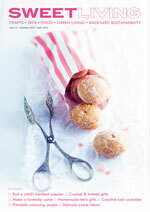 Eleanor Ozich’s new book, My Petite Kitchen Cookbook: Simple Wholefood Recipes, is truly sumptuous. With more than 100 simple, whole food, gluten-free recipes, this collection of delicious family meals replaces sugar and grains with natural, unprocessed alternatives. 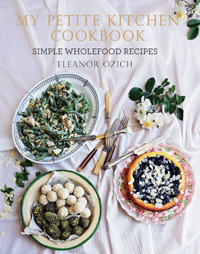 Eleanor’s recipes show how easy it is to prepare healthy food that is bursting with flavour and goodness. From caramalised shallot and sage frittata, apple and sage pork cassoulet and slow-cooked zucchini with basil and lemon, to decadent raspberry and coconut chocolate torte and lemon and coconut truffles, My Petite Kitchen Cookbook includes breakfasts, lunches, dinners and desserts, and everything in between. A divine book for yourself or a friend. If you have a food processor that does not tend to blend well, soak the dates for a few hours before using; this will help the mousse achieve a smoother consistency. Go ahead, indulge – your body will love you for it. Pour the coconut cream into a small saucepan and warm ever so slightly. Stir in the cocoa powder and whisk until smooth, then leave to cool. Put the avocado, dates, orange juice and vanilla in a food processor with a pinch of sea salt. Add the cooled cocoa mixture and blend for 1–2 minutes, until completely smooth. Spoon into four 150 ml (5 fl oz) dessert cups. Sprinkle with the orange zest and shredded coconut and refrigerate for an hour or so, until well chilled. 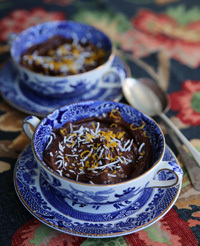 The mousse will keep covered in the fridge for up to 2 days; garnish with the orange zest and coconut just before serving. This is an edited extract from My Petite Kitchen Cookbook by ELEANOR OZICH, published by Murdoch Books, RRP $45.00, available now.